Quarter of a 300-gram piece of an exquisite sausage made from a whole pork loin, without external fat, marinated with a dressing prepared with paprika, garlic, oregano and olive oil. The loin is a stuffed piece, which means that it has been cured inside the natural pork gut, like a whole piece, without chopping. 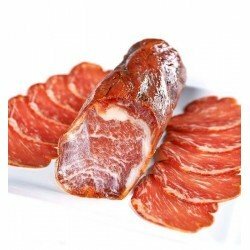 Lomo Gran Reserva, from the same type of white pork from which the famous Serrano ham is obtained, is undoubtedly a high-quality sausage that everyone will want to try. As the common saying goes, "every part of the pig is used up" and without a doubt, the loin of pork is one of the noblest products obtained from the pig. This delicious sausage is a delicacy that is usually not missing on the table during special occasions and one of the indispensable components of a good Christmas hamper. The sausage known as lomo is made from salt-cured pork loin, but unlike pork legs, which are also salt-cured, it is seasoned with garlic, oregano and paprika. The loin is "stuffed" into a pig's intestine for dry curing. At Enrique Tomás we offer you an extraordinary range of Gran Reserva products that have a mild flavour and represent the first step in quality of our variety of cured products. The lomo can be made from white pig and Iberian pig. 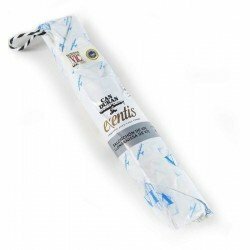 In this case we have prepared for your enjoyment a wonderful sausage with the loin of white pigs of our region fed with feed and cereals, which gives it a slightly salty taste perfect for snacking on any occasion. The Spanish gastronomy is world famous and its sausages, together with the Jamón Ibérico, are one of the protagonists of this popularity. Each region and town has its own products and, above all, the traditional preparation and local flavours are valued: chorizos, fuet, salchichón, chistorra and other wonders that many of us could not do without. 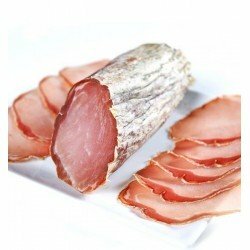 When we speak of sausage we refer to a processing technique, therefore, what is known as cold meat is not sausage, nor can our beloved jamón be considered as such. To make a good sausage you need meat from different parts of the pig (lean areas and fat) and seasonings that can vary according to each cook and/or product to be prepared. Once all the ingredients have been combined, the mixture is stuffed into a natural or artificial casing, as the case may be, and allowed to cure for as long as it needs to acquire its colour, flavour and texture. Ingredients The "lomo" is one of the most appreciated dry sausages in Spanish gastronomy, and the higher its quality, the more enjoyable for the palate. That is why at Enrique Tomás we offer you the best selection of lomo so that you can enjoy a delicious product in every bite. Our lomo comes from the best pigs, produced from one of the noblest pieces of this animal, located on the dorsal part, an area in which the absence of external fat is almost total. Instructions It is recommended to keep it in a dry and fresh place.Once the piece is started, it is recommended to consume it in less than 21 days so that it maintains all its flavor, quality and properties. In summer it should be consumed in less than 16 days. Cut each time only the product to be consumed at that time, put a film on it and store it in the refrigerator.